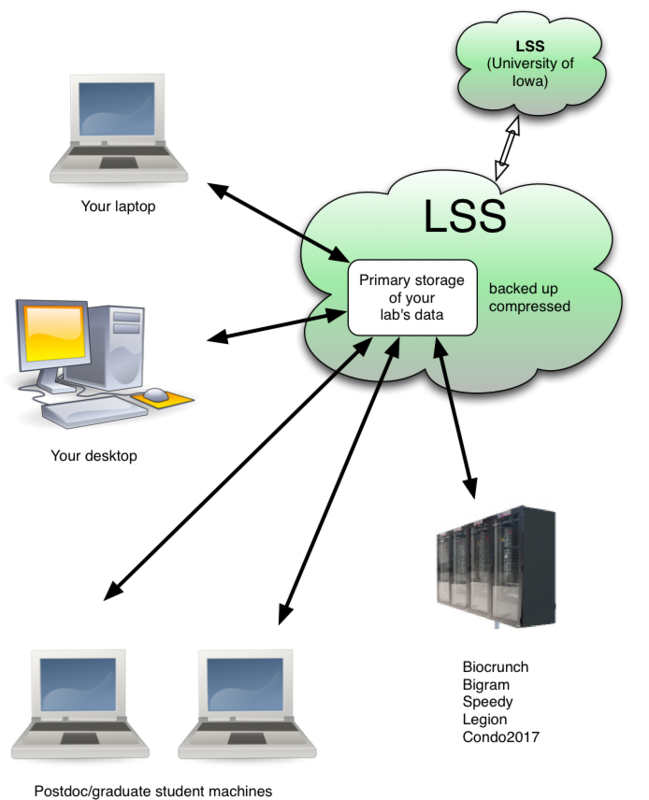 Large Scale Storage (LSS) is a research file storage service for faculty and staff. LSS is a software defined storage solution, and contains approximately 2 petabytes of usable storage, with the ability to continue to grow. LSS has been designed to provide an extremely low cost, reliable solution for storing large quantities of research data. The primary user audience for this system is research labs who need to store terabytes of data for long periods of time. LSS is useful for backups, archiving, and storing large files (e.g., videos, sequencing data, images, etc.) The system is not meant for holding data related to administrative business, supporting critical business processes, or providing backing storage for web applications or virtual machines. Support for the service is available Mon-Fri during normal working hours by opening a ticket with lss-help@iastate.edu. LSS storage costs just $40 per terabyte per year, and can be paid for by individual researchers or groups, or can be subsidized by a college or department. Please visit https://lss.apps.it.iastate.edu/ to request space. Redundancy: Data is stored redundantly across disks within each server. Within each of the server nodes, protection is provided for two disk failures, and software protects against silent data corruption. Reliable Uptime: The full system will be taken offline approx. 1-2 times per semester for system maintenance such as security patching. This will be coordinated with the research groups as each server is taken offline. Snapshots: We take hourly, daily, weekly, and monthly snapshots. This provides some protection against errors such as accidental deletion or modification of a file. Secure: The LSS system is managed by experienced IT professionals from across several IT units including central University IT and the colleges. The system has undergone an information security review, is kept current with relevant patches, and secured against unauthorized access. Users must be on the Iowa State network or connected via VPN to access their folders. Access is granted to NetID's via group membership. Disaster Recovery: All of the data is mirrored to servers at the ITF data center at the University of Iowa. This system is not available as a hot failover, but data can be retrieved in the event of a catastrophic failure, act of nature, etc. that may impact the LSS system at Iowa State. Compression: Data on LSS is compressed, meaning that if your data is compressible it will take up less space than when stored by traditional means. Snapshots refer to the state of your storage space at a certain point in time and are "free" until files that were present at that point in time are changed or deleted. In order for files referred to by snapshots to be available after they're deleted they still have to be present on your storage, meaning that if you delete a file, it is not actually deleted until after the snapshot is deleted and as such still consumes space. Generally, if you want to reclaim space after deleting files you'll need to email lss-help@iastate.edu or researchit@iastate.edu and ask us to delete snapshots for you, or wait until the snapshots rotate out automatically. Before asking for snapshot deletion you should make sure that you will no longer need any of the data that may have been deleted after those snapshots were created as it will be unrecoverable. Below are a few examples of the types of situations where LSS would be a good solution. This list is not exhaustive, but can provide some insight into when to use LSS vs other storage solutions such as CyBox. I perform research in the biological sciences, and need somewhere to store large amounts of data that I've received from a sequencing facility. I often need to analyze this data on high performance servers or clusters, and also need my lab members to have access the the raw data and the output from our jobs. I can use LSS as the permanent storage location for my critical research data. When I need to run an analysis, I will copy the data to the local storage of the server I'm working on, and then copy the results back to LSS when I'm done. My research involves large quantities of photos or videos. I often need to perform some analysis on this media on my computer, or use the files to produce edited output content. I can keep my files on LSS, and copy them to my computer for editing and analysis, and copy the final product back to LSS when I'm done. I do a lot of field work, capturing data from observations, sensors, etc. I primarily work with the summarized analysis of this data, but I need to keep the raw data around for a long period of time in case I need to refer to it again. I keep my raw data in LSS, but I store my associated spreadsheets, manuscripts, etc. in my CyBox folder where I'll do the majority of my day to day work. Please email researchit@iastate.edu with general questions, or lss-help@iastate.edu to open a ticket related to LSS storage.